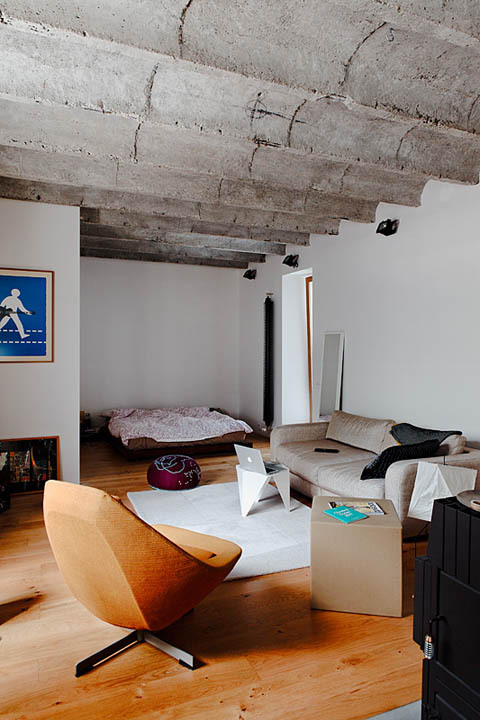 How about a little trip to Bratislava in order to witness ourselves the magical transformation of a not so inspiring one bedroom apartment to a lively, comfortable mini loft? Thanks to demolishing walls and completely removing the bathroom, a new floor plan was able to be designed, creating a cool tiny living space of no more than 44 square meters. 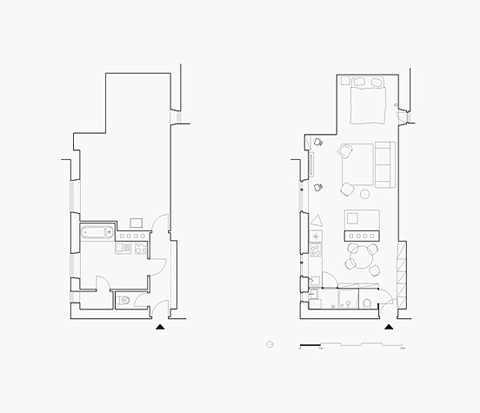 A floor plan promoting open living and a rather modern, energized style of life, where action seems to be the center. No need for a large bathroom – a small but convenient shower is enough. The rest of the space hosts all other every day activities: sleeping, eating and living. A cozy bed nook has been created at one of the rectangular apartment’s far end, leaving lots of space for an actual living room, where TV can be watched, music can be listened to and cozy conversations can be enjoyed during the colder months. Cooking meals in the fully equipped turquoise kitchen must be fun! 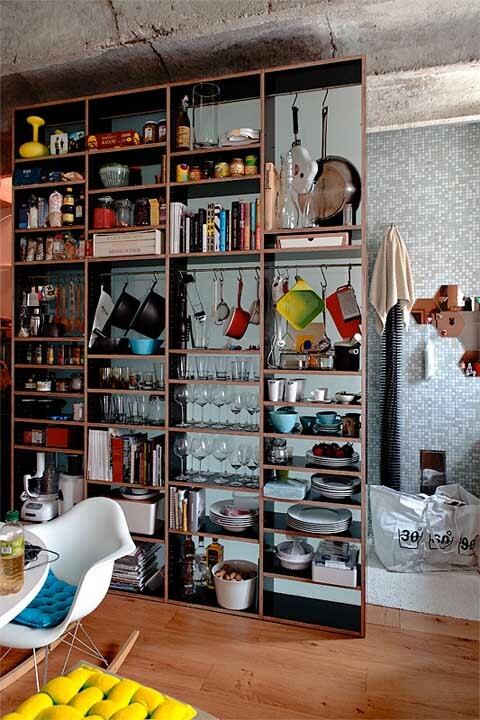 And storing everyday necessities like plates, glasses and books can be both practical and decorative when they find their places in open shelves covering a whole wall, extending from floor to ceiling. 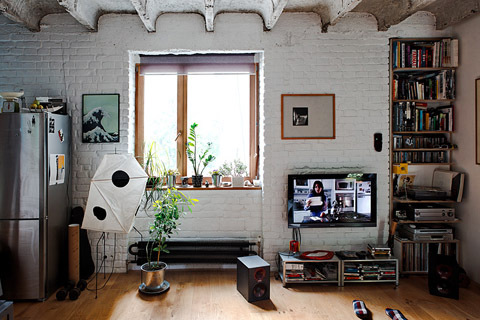 This mini loft is rich and full of texture, combining wooden floors, concrete ceilings and white washed brick walls, a feature I find so inviting! 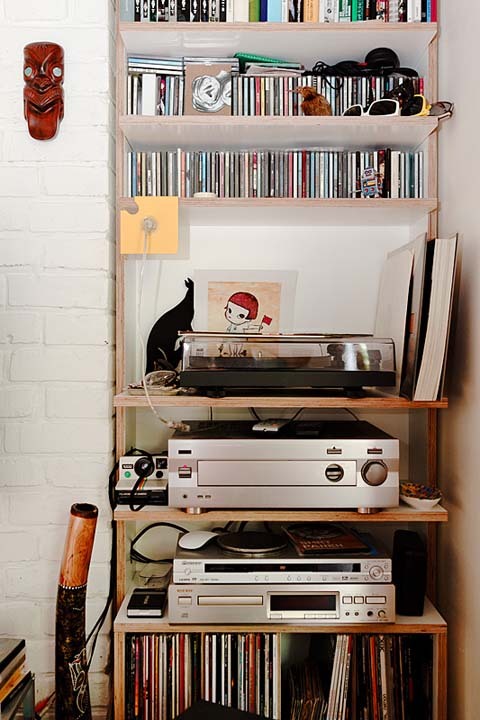 A happy collection of furniture and pops of color complete the scene.